I love metropolitan cities across the globe but not unwanted noise. These cities are full of energy, hopes, and creativity. Whether we talk about Newyork, Los Angeles, Shanghai, Tokyo and so on, you will love the aroma of these cities. A devil does exist in these cities and it's killing us slowly and gradually. Can you guess the devil? Of course, it's sound pollution. To make my readers aware of the side effects of noise pollution, I have written a detailed article which you can read here. Have you ever noticed that like me, you also get distracted by the unwanted sound? Sometimes, we even get stressed because of the echo of internal sound or external noises. Why we take noise so lightly? These unwanted sound can take a toll on your productivity. I have personally experienced it. When I started working from home, the first thing that I did was to soundproof my home office. I learned a lot about soundproofing while I was experimenting with my home office. In fact, I did a lot of mistakes. You always don't need to soundproof a room or an apartment until you need a complete quite place. By the use of certain soundproofing materials, you can reduce a major portion of the noise. Even if you are planning to soundproof your house, start with soundproof curtains. Soundproof curtains really work, the only thing that you need to take care of is to buy the correct curtain and use it the correct way. A few of my clients had a problem with the installation of these curtains. I will explain the entire process step-by-step. so, STAY TUNED. There is a wide variety of soundproof curtain available in the market and you can choose as per your requirement. 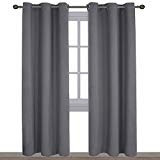 In case you are interested in my suggestion then I generally recommend three types of curtains, that is, Top Pick, My Recommendation, and Budget. I will also be talking about some other popular soundproof curtains. After being in this industry for quite a few time, I can assure you that these soundproof curtains are value for money product. If you are expecting a completely silent room then you can't achieve it with only curtains. These curtain best works when you are having an echo in the room or you want to reduce the effect of your child or pet unwanted noise. If you are staying near an airport or an industrial area then these curtains along with soundproofing foam are recommended for you. Before we discuss some of the common yet important questions asked by my client regarding soundproof curtains, please have a look at the budget, the top pick, and my recommendation soundproof curtains. Definitely, I am not gonna stop at these three options. Moving further, I will also talk about some of the other popular substitutes of these three soundproof curtains. If you are new to the soundproofing concept and don't have in-depth knowledge, then you have landed at the correct post. Our aim is not only to do the product review but to also educate you with the basic knowledge of the soundproofing and soundproof products. Unlike other curtains, these curtains are made up of special fabrics which helps in the reduction of noise. For example, even though you are watching television with decent volume, other members of the family might get disturbed because of the echo of the sound. These soundproof curtains play a crucial role in almost completely eliminating the echo. However, these curtains will not block the noise entering the room. In the layman language, it will not reduce the decibel level of sound entering the room. Yes, it really works in any scenario. For example, it really works great if your homerooms are big and you face the problem of echo. But at the same time, it will not alone very effective if you are looking to block the outside traffic or vehicle horn noise to enter your room. I know you will be wondering how a piece of cloth can reduce echo on the room, right? You aren't alone with this thought, I have handled a similar query with almost every client of mine. The curtain comes in a multilayer thick design with the sound absorbing capabilities. If you are looking for something more than just reducing the echo, then a combination of soundproof curtains and a soundproof window will do the needful. I will not recommend you to soundproof your wall until your requirement is complete silence or your home is near a railway station, airport, industrial area, high traffic zone. 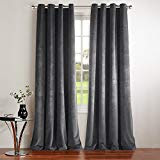 In case you are thinking of giving a try to these curtains, then you should be aware of these things before clicking a buy button. Don't do the mistake of buying a soundproof curtain of your window size. It will not work. As per my experience, the best dimension of length and breadth of the soundproof curtains that have really worked for my clients are as follows. Width: 2.5-3.5 times the width of the window. Length: 8.5 to 11.5 inches longer than the window length. Exception: Sometimes, people prefer to have soundproof curtains from the roof to the ceiling of the floor. Definitely, it comes with an additional cost but at the same time, a large surface area of the curtain leads to more absorption of noise. Along with the curtain, you can also try soundproof wallpapers. Keep an eye on the weight of the soundproof curtains, whenever you are going to click the buy button. Higher weight is directly proportional to the higher density of soundproof curtains. The higher the density the more will be the efficiency of the curtains. Though the soundproof curtains with heavier weight are good at absorbing and reflecting sounds still I recommend heavy curtains to only those clients who stay near the industrial area. Generally, heavier curtains are good at absorbing low-frequency noises. The main source of low-frequency noises is the machinery and Industrial sounds. Don't worry, even if you have bought a soundproof curtain of lightweight, you can fold the curtain multiple times to get a good result. Depending upon the intensity of echo and outside sound, increase the layer of your curtain. In most of the cases, tripling the layers of the curtain has given a great result. Can we use any kind of curtain rods? While buying a curtain rod, you need to keep two things in mind. Rod should be strong enough to handle the soundproof curtain weights. Increase the efficiency of the curtain. Though there are quite a few good options still I recommend the wrap around rods. Other than the few exceptional cases, I have only received good feedback. I hope you would have noticed the shape of this rod, the curves at the end of the rod plays a significant role. Trust me, it looks very simple and ordinary, but when it comes to noise cancellation efficiency, the curve shape contributes a lot. Because of this shape, you can almost negate the space between the wall and the curtain. The edge of the curtain will always be in contact with the wall, thus, maximizing the total surface area of the curtain. Higher the surface area of the curtain better will be the soundproofing. If you are going with some other curtain rods, then kindly keep a note that for the better output there shouldn't be any gap between the walls and the soundproof curtains. Whenever you are planning to buy a soundproof curtain, look for the higher percentage of fiber. The more the percentage of fiber the better will be the sound absorbing capabilities. I know you have doubt that how can I know which fabric contains more fiber? The answer is simple, look for velvet materials. Look for some of the commonly used terminologies like thermal insulated, microfiber etc. Also look for curtains with extra liners such as window liners, curtain liners etc. These liners act as an additional layer against noise penetration. What to look for, when you are planning to buy the "best soundproof curtains" from Amazon? 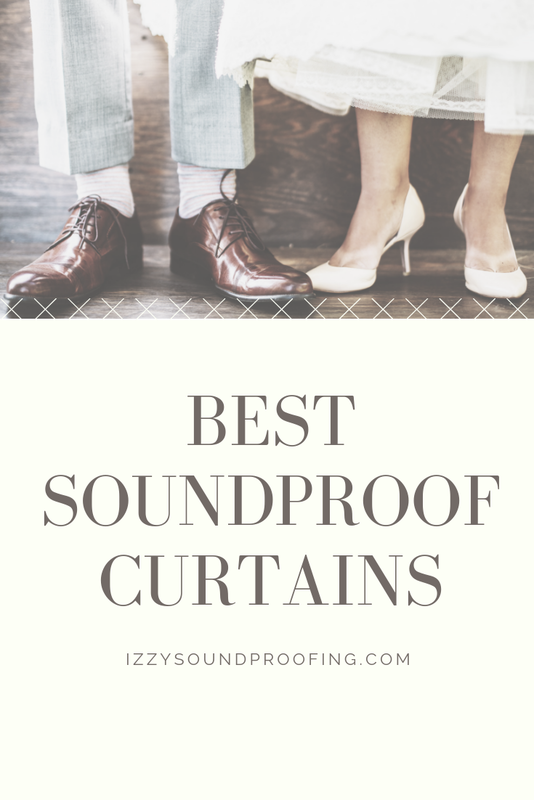 Whether my clients have to buy soundproof curtains for home or for industrial purpose, they ask me one common question, "What to look for when buying soundproof curtains from Amazon?". I thought my readers may also have a similar question in mind. So, it's better to throw some light on this query keeping my experience as a base point. 100% Blackout: Look for the features with 100 percent blackout. 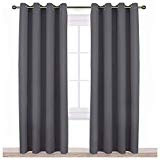 Generally, these curtains have a black liner which not only prevents the daylight to enter your room but also ultraviolet rays which is very bad for your health. Noise Reduction: Check for noise reduction. See if the product has any lab test credentials associated with it. Don't forget to read about the product features such as sound insulation, thickness, and the layer of fabrics. Energy Smart: Check for this thermal property or a similar one in the product features. The uniqueness about this property is that it retains the warmth in the winter and also maintain the coolness of the room in summer. Fade Resistant: It's good to have fade resistant soundproof curtains as it protects your indoor furniture from direct exposure to the sun. Service: Check for warranty, money back guarantee, and return policy. How good is it to use soundproof curtains as a room divider? Yes, you can use soundproof curtains as a room divider. This work well when your room is big and spacious. The benefits of using soundproof curtains as a room divider are that you can use a portion of your room for office or other purposes. Even you can make a portion as a separate identity such as pet room, child room and so on. To get the best results, use soundproof wallpapers along with bottom door blocker. 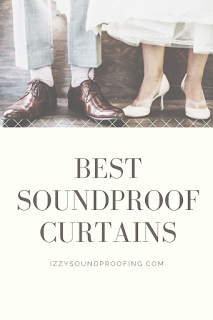 Though the name of the curtain is "soundproof curtain" but it doesn't do soundproofing. These soundproof curtains perform acoustic treatments. These are made up of "soundproof materials" which absorbs or dampens the sound. These curtains can be hanged vertical, adjacent to television and windows, and also can be arranged as panel surrounding noisy objects. The entire science behind soundproof curtains revolves around the mass. As mass plays a crucial role in absorbing sound, these curtains are made up of multi-layer high-density sound absorbing materials such as mass loaded vinyl, sandwiched in between a plush, decorative fabric. 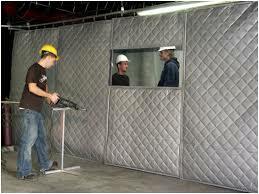 Industrial soundproof curtains are made up of mass loaded Vinyl and PVC coated fabrics. Unlike the residential curtains, these are looking like a quilt or blanket. These curtains are used to cover a noisy construction site at an urban location. At the same time, these soundproof curtains are equally popular against compressors, generators, industrial machines. As compared to Industrial soundproof curtains, these are lightweight and more decorative. These curtains are made up of fabrics such as velvet, wool, twill, faux suede, and cotton. Unlike the normal curtains, these curtains are heavier. Keeping the weight in mind, the curtain should be installed with care using heavy brackets and curtain rods. Till now, we have discussed the things that are necessary from buying point of view. The intention of this post is to make you familiar about not only the best curtain available in the market but to also guide you in selecting the one that suits your requirement. I am going to talk about some of the well-known curtains on the market. Every curtain is unique and has its own pros and cons. None of these curtains alone is capable of serving all the needs. You can't say that the costliest is the best and the vice versa. We will try to touch all the aspect of the curtains so that you will be able to take the decision on choosing and buying your first curtain. The NICETOWN is a well-known name in the soundproof curtain segment. To cater to the needs of the vast range of customer base, they have come up with a different variant. The best thing about the brand NICETOWN is that they match up to customer expectation. They are expert at selling the soundproof curtains by creating the need. Here, we are talking about the top line product of NICETOWN. 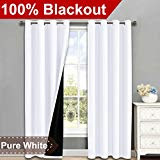 This curtain is mainly popular among the people because of its ability to completely black out the light. These curtains make a great choice when it comes to buying a soundproof curtain for the bedroom. Before writing the review for this variant of NICETOWN, I was just scrolling down the feedback of the clients at Amazon. Literally, I was astonished to see the positive response by the buyers. 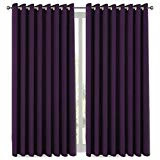 This curtain not only prevents the sunlight to enter your room but also prevents ultra-violet rays completely. In case you work in night shift, then go and buy this curtain without giving a second thought. If these curtains installed properly will give you a proper night kind of sleep in the daytime. But we also want to know about the soundproof capabilities of this curtain, right? If we talk about the reviews and ratings, then it's mindboggling. Hundreds of customers have given fantastic feedback about this product. Out of all the reviews, 84 percent falls into the 5-star rating. The product has received a rating of 4.7 and above on all the three key features- durability, value for money, and material quality. I forget to mention that these curtains fall under the category of the multilayer. Being a multilayer curtain gives it an edge over the single layer curtain by absorbing twice the sound as compared to single layer curtain. One significant benefit is that it doesn't contain any chemical. It's a hundred percent safe to use. Don't worry about your small children, this curtain will not do any harm. It acts as an insulator so your room will be cold in summer and vice-versa. It also gives you 30 days money back guarantee. The curtain is made up of 100 percent polyester. It comes in a package of 2 panels, each having a dimension 52" wide x 95" long. 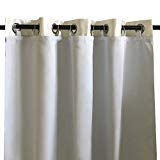 The curtain comes in four color- pure white, white, grey, and beige & grey. I recommend this product particularly for a living room, kitchen, bedroom, babies room, villa, and hall. Length: 18, 24, 36, 45, 63, 84, or 95 inches. The desirable temperature range to wash the soundproof curtain in the washing machine is below 86 degrees Fahrenheit. Ironing is preferred at low temperature. Again a great soundproof curtain from NICETOWN. Over a period of time, NICETOWN has established itself as a well-known brand in the soundproof curtain segment. The curtain is a unique creation of the company and is recommended to someone who is looking for soundproof curtain with not 100% blackout. It prevents almost 85 percent of the sunlight and UV rays to enter the room. I recommend you to use this curtain in the dining room and bedroom. The innovative triple weave technology prevents the background shades to appear on the television and thus, helps in better television viewing. The other benefit of the triple weaving is helping in maintaining the temperature in both summer and winter. The curtain is machine washable and tumbles dry. You can go for quick ironing as per the need. It's wrinkle-free and available in a variety of color. When it comes to noise cancellation, I will not say that this product is the best in the market. If we talk about the customer review and ratings, it's awesome else I wouldn't have even picked it for review. The reviews are enticing and interesting. More than 4500 have rated this product with a rating of 4.5/5. Though the material quality and durability have scored almost 4.5/5 and 4.3/5 respectively still I feel the noise cancellation can be improved a bit. For noise cancellation, I will rate it 3.5/5. The product available at Amazon includes 2 BLACKOUT PANELS of 42" wide x 84" length with 6 grommets top each. Length: 63 and 84 inches. Machine washable with almost zero cost maintenance. This is the quality and brand value of NICETOWN in the curtain space. To review this variant is my pleasure. I applied this curtain in my new apartment and am more than happy to recommend it to you. If you want to give your room a luxurious look, then you don't have any better option than the velvet woven. But, it looks fabulous when the height of your room is well above 100 cm. To those who want to cover the window from ceiling to floor, I will say it's the one they should go with without any second thought. In my new apartment, I have converted a room into the home theatre. I had a problem with the sound echo. I wanted to place a soundproof curtain but at the same time, I was not ready to compromise on the look and feel of the room. I searched a lot and finally selected this product. Trust me, Guys, It's really awesome. The Plush velvety fabric proved to be a great sound observer. It not only absorbed the room sound but also prevented the outside sound to enter the room. The only problem with this curtain is that you can go for machine wash. Only steam wash can refresh the fabrics and remove the fold lines. Ring top and Pole top options. Length: 84 and 96 inches. Just for an experiment purpose, I tried once machine washing and it was my biggest mistake. The velvet lost it's freshness and shining. So, never try machine wash.
Before we discuss the other top alternatives of NICETOWN that are as good as this brand, I just want to discuss with you about the advantage and disadvantage of the soundproof curtains. There is no doubt that it has a lot of advantages but there are a few disadvantages also. Not as appealing as the normal curtains. Blackout, even if not needed. Washing problem with a certain variant of soundproof curtains. If you want to hang a soundproof curtain with the existing hooks and rods, then it may be a probability that these hooks can't withstand the weight of these heavy curtains. You can try the one, I am using for my soundproof curtains. If you are planning to use soundproof curtains for your bedroom, then its good and there isn't any problem but at the same time using the curtain for the dining hall and other rooms can be troublesome. The reason is that most of these curtains will reduce the sunlight by at least 85 percent. Though you don't want blackout still you have to go with it. If you are using the curtain for the first time, they may not love the look and feel of it. I will not say it as a disadvantage but it matters. The Versailtex is a competitor of NICETOWN and provides a good range of soundproof curtains. These curtains are more popular among the classes as compared to the masses. The classic grommet variant is unique in the appearance. Generally, it will appeal to the people who are more prone to a classic look. The curtain is available in 12 elegant colors and comes with a copper grommet. The focus of this curtain is more towards sound absorbing as compared to a blackout. It consists of 3 layers and is 108 cm long. The inner layer is made up of black yarn and the outer layer is made up of faux linen fabric. Multiple layers help in sound absorption and the linen fabric makes it completely wrinkle free. Length:63, 84, 96 or 108 inches. Though you can use non-chlorine bleach and wash it in the washing machine under low temperature still I will suggest you go for a steam wash.
Versailtex tries to target the high-end customer through this variant of the soundproof curtain. These curtains are bit longer and wider as compared to other variants. They are 100 inches wider and 108 inches long. If you have small children in your house, then I will recommend this curtain to you. The best part about this curtain is that it doesn't contain any toxic chemicals like PVC or vinyl. I have seen over a period of time that it's really good to have almost 1.5 to 2.0 times wider curtains for best soundproof results. Machine wash is recommended at low temperature. The variant comes in eleven different colors with 16 strong grommets at the top of the curtain. These curtain looks so elegant when hanged on a decorative curtain rod. The best thing about the curtain is that its' 100 percent eco-friendly. The company claims that it doesn't have even a small percentage of PVC or vinyl. You can expect 99.9 percent UV rays blockage and 98 percent sunlight blockage. Whenever I am planning to buy a curtain, I will definitely look for non-toxic curtains, that is, free from toxic elements like PVC and vinyl. I will recommend this curtain if you have glass french doors or big patio doors. Because of the length and breadth of this curtain, it can be used as a room divider. My favorite color is Plum Purple. If we talk about the disadvantage, then yes, this curtain has some loopholes. Though the fabrics are tightly woven and drapes are fantastic still lack of rubberized backing is a point of concern for an especially white and grey color variant. Some people have raised the concern as these color's curtain weren't very effective in blocking the sunlight. 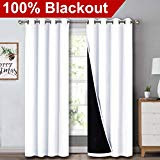 "Choose the color of the curtain wisely"
"Length and Mounting are important factors to achieve complete blackout effect"
You can use a warm iron and tumble dry low. The drift away liner is made up of polyester and is recommended to those who want to use an existing curtain in the best possible manner. It fits the 96-inch length grommet curtain. The 16 metal rings help to perfectly fit the liner to the old curtain. It's very well visible in the picture the benefit of using the liner with the curtain. The thing that I really like about these liners is the absence of the chemical smell. The high-density black yarn plays a crucial role in blocking the sunlight. Some other benefits include energy saving, machine wash, thermal insulation, and noise reduction. When it comes to sound reduction, it will perhaps not be the best choice. For daily sound dampening, you can think of giving it a try. It can reduce internal house noise but when it comes to external noise reduction, definitely, these liners are not the best option. You can also use these liners with some soundproof curtains for the best result. Before, we talk about one of the most expensive soundproof curtains brand available in the market, let's have a look at some of the handpicked articles. Unlikely, the other soundproof curtains that come under 50 dollars, you can get the best variant of Moondream brands, a bit above 100 dollars. The brand claim to use a patent technology that provides a 3 in 1 solution. Further, the brand claims to reduce the noise up to four folds-reaching a drop of up to 7 decibels. The product is sold as a single panel- 57 inches wide by 108 inches long. The grommets are rust free. Machine washing is not recommended. You have to go for the dry cleaning. Before writing about the Moondream curtain, I did some research which also includes the customer feedback on Amazon. Unfortunately, the feedback on the Amazon is not appreciable. On the whole, the brand has 3 stars out of 5, when I am writing this article. It seems that the sound reduction is not in accordance with the claim made by the Moondream. A few of the buyers have also claimed a strong odor. Definitely, I will NOT recommend this curtain. But, If you are planning to buy one or already have one, then please let us know your experience with this product. 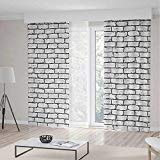 So, if you are still on the page and reading this article, then I can definitely say that you have planned to buy a soundproof curtain at the earliest. Before I discuss with you my top picks, let's have a look at the installation part of the soundproof curtains. If this is the first time, you are going to install soundproof curtains, then you can follow these steps. There is definitely no need to hire a person for the installation process, it's quite simple and you can easily install it. While installing the curtain, you need to keep few things in mind. The most important thing is the placement of the curtain rod. I will recommend you to place the curtain rod at least 6 inches above the window frame. As per my previous experience, I will suggest you, buy a curtain which is 1.5 times wide and at least 8 to 9 inches long with respect to the window frame. For the best results, try to place the window rod as near as possible to the ceiling. Another important thing that really matters is the shape of the rod. 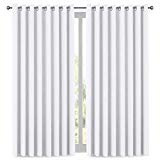 I recommend a curve shape rod because it reduces the distance between the curtain and window. As a result, you get better soundproofing. The first step is to mark the level of the bracket location on the wall. Try to keep it as horizontal as possible. Then, check the placement of the brackets. Now, install the wall anchors. Try to get a deeper hole in the wall because the soundproof curtains are heavier. Moving further, set the bracket and drive in the screws and make it tight. If the rod is wider then you will definitely need center support for a better balance. The last step is to install the rod and hang the curtain. Once you have completed these steps, just install the cap at the end of the rods. The best part is the curtain comes with an installation guide. Read carefully the instruction to perform the installation correctly. Now, we have reached the last section of this post where I talk about my choices and my picks. Just to make you aware of the fact that my picks may not be the cheapest or the highly reviewed and rate product. My pick is based on my thought process and all the parameters that I will look for when I am gonna buy the product for myself. When I am gonna buy a soundproof curtain, the first thing that I look for is the look and feel of the product. Secondly, I look for the symmetry of the product with my room. The last thing that I look for is the ratings and feedbacks on the Amazon. I know you will think 'what rubbish I am talking, right?'. But, it's a fact because most of the time I love trying some new products which have either very few or no ratings. If I am going with the reviews and ratings available on the e-commerce websites, it means I am restricting myself to a certain number of the product. This is totally my personal view, I love experimenting with the new products. One thing I forget to mention, I don't have a child in my house else eco-friendly and non-toxic should be my first priority. If you are tight on the budget, then I will recommend you to go with the product with high ratings and a good number of reviews. The Grunge brick wall curtain is definitely an elegant masterpiece by iPrint. Though this variant is highly expensive still it's my favorite pick. If you have bought a new flat or you have good interior design, then it's one of the few options available in the market to go for. The curtain is available in different shape and size. It's also available in multi-color shades. Though the curtain is heavy still it's made up of soft materials. The classy look will add up to a more decent and elegant lifestyle. Vintage rustic, Victorian interior decoration, contemporary etc are some of the great terms associated with this masterpiece. The curtain addresses all the four parameters, that is, thermal insulation, room darkening, noise reduction, energy saving. So, I will say it's a complete package. The product is completely eco-friendly and uses the cutting edge laser technology. Besides having the same color on both sides, it doesn't have any foil printing or chemical coating. These curtains are machine washable. Last but not least, the drapes enjoy 30 days of money back guarantee. The length and breadth of this soundproof curtain is 260 cm and 400 cm respectively. These curtains look best in the 3D effect and use inkjet color printing technology. The curtains are thickened with matte cloth. In case, you are a tech-savvy and love trying new things, then this one is for you. The curtain is a bit costly and I recommend you to only try if you can take a risk of experimenting with the curtain. Frankly speaking, I haven't tried this curtain and there is little information available about this curtain as of now. If you are planning to give it a try, let's us know your feedback, we will inculcate your experience in this article. 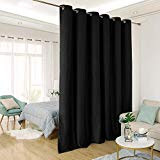 Are thermal and blackout curtains the same? Though the thermal and blackout curtains are not the same still they have a lot of common and overlapping features. The blackout curtains are made up of tightly woven fabrics to block the unwanted sunlight. 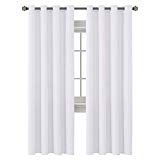 On the other hand, thermal curtains have multiple functions- dampen sound, reduce energy bill, block out sunlight. Do curtains help with noise? Frankly speaking, the soundproof curtains will definitely help you to reduce sound echo in the room but the effectiveness of these curtains in reducing the external sound such as traffic noise is still a question mark. Final Verdict: Which is the best soundproof curtain? Frankly speaking, I can't pick up just one and say this is the best soundproof curtain. I can assure you that all the curtains mentioned in the list are good for some reason else I wouldn't have picked them. I have also mentioned my pick, you can definitely give them a try. Anyways, if you are looking for a durable, cost-effective, and elegant soundproof curtain, then my bet will on H.Versailtex Premier. @Nisha: The great products always make to our list.